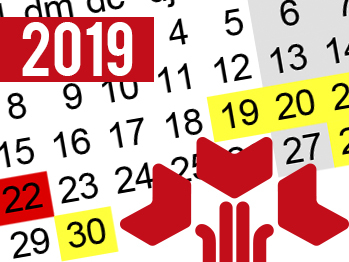 The calendar of days of sale of the Mercat de Flor i Planta Ornamental de Catalunya for this year 2019 can already be consulted. In this document, approved by the Board of Directors, you will find indicated the extraordinary markets agreed with the stallholders, holidays, and the special schedules that have been programmed to offer the best service to the customers. It is worth mentioning the new schedule for January, in which Direct Sales Hall will only open in the morning, from 8 to 13 hours, and the extraordinary markets planned for Easter in order to attend the sales of Sant Jordi. It should be said that, in case there were modifications to this calendar, we will properly inform through specific circulars and on our networks. If you have any questions about this, you can contact Information at Tel. 93 750 00 00. You can order a copy in PDF HERE!